I forgot to show you my Thanksgiving table! Pretty much every year I tell myself that I'm going to set aside an hour or two to really dress my table - sort through linens and chargers and glassware and come up with something spectacular....and every year, I'm left with about 5 minutes to throw things on the table. This year was no exception. And I didn't have flowers! Totally forgot to buy some, so I improvised. I will say the Caspari placemats and napkins in Imari really did the heavy-lifting. 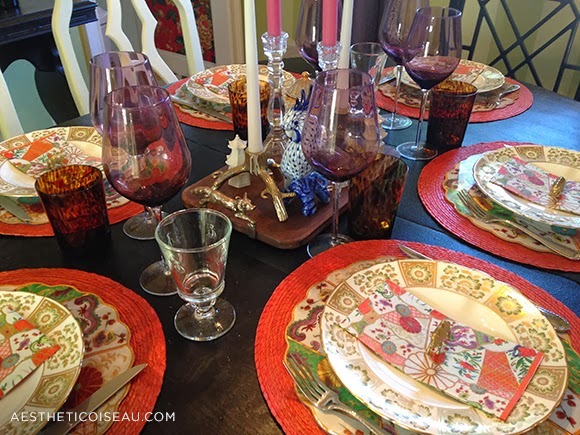 The table was pretty with the bright pops of pattern in all of my favorite colors and the jewel tones made the setting very festive and autumnal. And I was so very pleased with how they looked with my china (Derby Panel Green from Royal Crown Derby). Now on to Christmas decorating!